The Azadeh Ensemble , made up of Sahba Motallebi, 2nd from left, then Sepideh Raissadat, Laya Etemadi, Bahareh Moghtadaei right and joining them as guest artist on left, Negar Booban, in performance at Town Hall in Seattle, on Friday Feb. 5th, 2010. On Friday evening, Town Hall Seattle presented the Azadeh Ensemble, four outstanding virtuoso Iranian women musicians who formed in summer, 2009 in response to the political events in Iran, and the prominent role women have played within it, in their Northwest debut on Friday. In Farsi, the language of Iran, Azadeh means liberated. 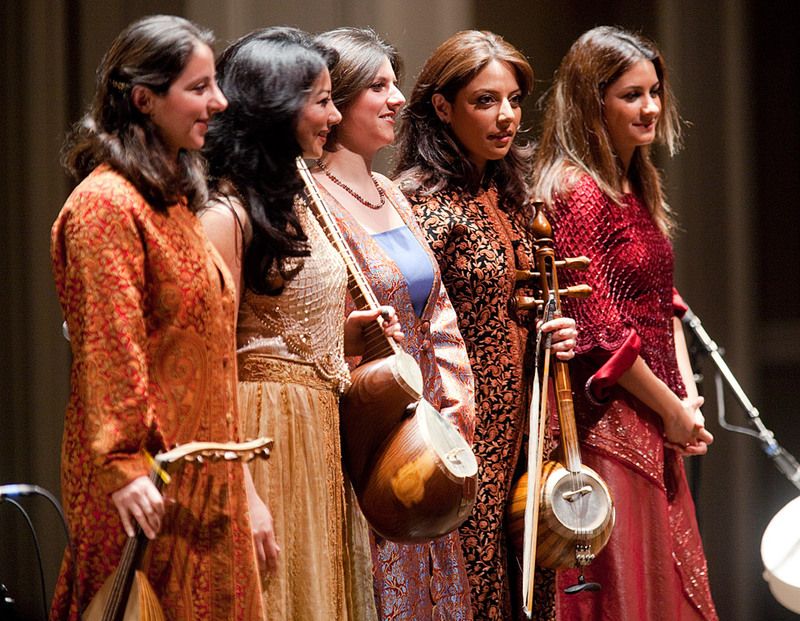 Azadeh Ensemble is one of the few all-female ensembles playing classical Persian music. Their exciting interpretations combine centuries of musical history with modern concerns of individual freedoms and the female voice. Their vivid repertoire draws from classical Persian music, speaking especially to the concerns of individual freedoms and the female voice. As a women’s group, the Azadeh Ensemble is truly a rarity in Persian music, bringing these traditional forms into a dynamic contemporary context. Heading the ensemble, all of whom were born and trained in Iran but now live in the US, is the remarkable tar (a lutelike instrument) player Sahba Motallebi celebrated for the vigor and clarity of her playing on this stringed instrument, joined by the gifted vocalist Sepideh Raissadat, virtuoso kamanche (a Persian fiddle) and viola player Laya Etemadi, and Bahareh Moghtadaei on the tombak (drum). In the secod portion of their performance they were joined by joined by guest artist Negar Booban, of the Teharan Conservatory of Music, on the oud. Not being familiar with Persian music it was enchanting and exotic: it was delightful and uplifting and also spiritful. At times I heard strains of the some traditional American blues and at other time their music brought to mind some old Irish folk tunes between the strings and drums. But most of the time it was as graceful and transporting as it was unfamiliar.Knowing their story and how they came to play together was inspiring. It is hard to believe that they can never play in thier home country together like this. I feel sorrow for them and even more for their fellow countrymen. I hope one day they may go and perform such as concert in their homeland. All photographs on this website are Daniel Sheehan © 2010. All Rights Reserved. Please inquire for permission to use. You & your friends are excellent.We are so proud of you. dear sahba you ‘r very excellent. thank you.